One hundred per cent of coffee sales send economically disadvantaged kids on a life-changing camp experience. Funds raised help Tim Hortons restaurant owners sponsor kids in their own community. 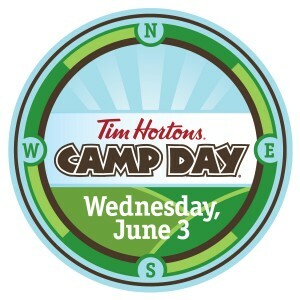 OAKVILLE, ON, June 1, 2015 — On Wednesday, June 3, Tim Hortons Camp Day, your daily Double Double will have added benefits. One hundred per cent of coffee sales will be donated to the Tim Horton Children’s Foundation (THCF) helping to send 18,000 kids from low-income homes on a life-changing camp experience. This year, Tim Hortons guests can also round up their purchase to the nearest after-tax dollar to help ensure that even more kids can benefit from this enriching camp experience. Camp Day is the THCF’s largest fundraising event of the year, and every dollar raised on Camp Day goes directly to sending kids to one of seven THCF camps across North America. Last year alone, $12.2 million was raised in Canada and the United States, allowing over 17,000 kids to spend a life-changing session at camp. The THCF camp experience comes at absolutely no cost to kids and their families. With the help of funds raised on Camp Day, Tim Hortons restaurant owners sponsor kids directly from their community to attend camp and work closely with local youth organizations and schools to identify children who would benefit most from the experience. For many children, camp is the first time they have ever travelled outside of their community. While at camp, kids participate in a wide range of top-tier programs and activities designed to build self-confidence, self-esteem and leadership skills. Children who attend camp often return home with a more positive outlook and greater confidence about their future. This summer, THCF will open its doors to even more campers with the grand opening of its seventh camp, Tim Horton Camp Whiteshell, in Pinawa, Manitoba. Located on the shores of Sylvia Lake inside Whiteshell Provincial Park, Camp Whiteshell will focus on the Foundation’s unique Youth Leadership Program, which takes place over five summers and focuses on building lifelong leadership skills, teamwork and independence. Tim Hortons guests looking for more ways to help can make a donation any time at SENDAKIDTOCAMP.COM or by purchasing a Rent-a-Tent ($1) or Rent-a-Cabin ($5) in restaurant. A $5 donation can also be given by texting CAMP to 45678 in Canada and 41518 in the United States. Camp Day supporters can also join the #CampDay conversation online with the Tim Horton Children’s Foundation (FACEBOOK.COM/TIMHORTONCHILDRENSFOUNDATION; @THCF1974 on TWITTER; YOUTUBE.COM/THCF1974 ) and Tim Hortons (FACEBOOK.COM/TIMHORTONS; @TimHortons on TWITTER and INSTAGRAM). The first Tim Horton Children’s Foundation camp opened in Parry Sound, ON in 1975 with just 200 kids. Today, the Foundation operates seven year-round camps across North America serving more than 18,000 low-income children each year. Each camp offers a traditional summer camp for kids ages 9 to 12, a year-round camp serving schools and youth groups, and a five-level Youth Leadership Program for kids ages 13 to 17, focused on building lifelong leadership skills. The Tim Horton Children’s Foundation (THCF) is a non-profit charitable organization founded in 1974 that is committed to providing an enriched and memorable camp experience for children and youth living in economically disadvantaged homes. The Foundation’s funding comes from Tim Hortons Camp Day, fundraising activities, special events, and year-round public donations collected through counter and drive-thru coin boxes, as well as other donations. By the end of 2015, more than 215,000 children will have attended a Foundation camp at no cost to them or their families. For more information about the Tim Horton Children’s Foundation, please visit WWW.THCF.COM. Tim Hortons, part of Restaurant Brands International, is one of North America’s largest restaurant chains operating in the quick service segment. Founded as a single location in Canada in 1964, Tim Hortons appeals to a broad range of consumer tastes, with a menu that includes premium coffee, hot and cold specialty drinks (including lattes, cappuccinos and espresso shots), specialty teas and fruit smoothies, fresh baked goods, grilled Panini and classic sandwiches, wraps, soups, prepared foods and other food products. As of April 27, 2015, Tim Hortons had 4,724 systemwide restaurants, including 3,773 in Canada, 892 in the United States and 59 in the Gulf Cooperation Council. More information about the Company is available at WWW.TIMHORTONS.COM. Restaurant Brands International Inc. is one of the world’s largest quick service restaurant companies with approximately $23 billion in system sales and over 19,000 restaurants in nearly 100 countries and U.S. territories. Restaurant Brands International owns two of the world’s most prominent and iconic quick service restaurant brands – TIM HORTONS® and BURGER KING®. These independently operated brands have been serving their respective guests, franchisees, and communities for over 50 years. To learn more about Restaurant Brands International, please visit the Company’s website at WWW.RBI.COM.